Bishop Joe A. Wilson will retire as the United Methodist Bishop-in-Residence at Southwestern University, Georgetown, Texas effective May 31. Bishop Wilson’s has been Southwestern’s Bishop-in-Residence for the past 12 years. Bishop Wilson, who served as Bishop of the Central Texas Conference from 1992-2000, has a long history with the Southwestern. His relationship with the school began with his great-great-great grandfather, Francis Wilson, who founded Wesleyan College – one of the four colleges that merged to form Southwestern University in 1872. Bishop Wilson’s link to the college continued with four years as a student (1955-59), then eleven years as a trustee (1989-2000) and the final 12 as Bishop-in-Residence (2001-13). 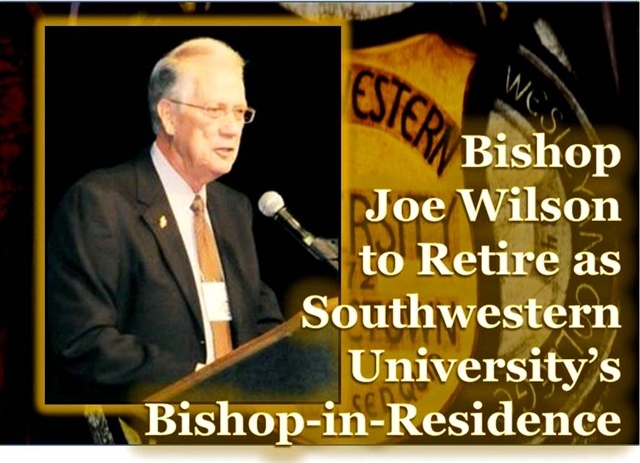 Bishop Joe Wilson spent his years of ministry as a pastor in the Texas Conference prior to being elected Bishop and serving the Central Texas Conference.He was honored in 1995 as the Distinguished Alumnus of the Southwestern University.